Richard J. Ackerman, 86, of 1404 Belle View Boulevard, died Monday at Mt. Vernon Hospital here [in Alexandria, VA]. Born and raised in Springfield, Mass., he moved to Agawam, Mass., in 1954 and to Deltona, Fla. in 1979. He moved to Alexandria in 1999. He was an Army veteran of World War II. He was a former communicant of St. John the Evangelist Church and a member of the Nocturnal Adoration Society in Agawam. He was a member of the Knights of Columbus in Florida. His wife, the former Dorothy McManus, died in 1996, and a son, Patrick Ackerman died in 1967. He leaves a daughter, Debra Ackerman of Alexandria; and a sister, Louisa Aldrich of Troy, N.Y. The funeral will be Saturday morning at West Springfield Curran-Jones Funeral Home and in St. John the Evangelist Church in Agawam, with burial in St. Michael's Cemetery, Springfield. Calling hours are Friday afternoon and evening. Memorial contributions may be made to Family Respite Center, 2036 Westmoreland St., Falls Church, VA 22043. 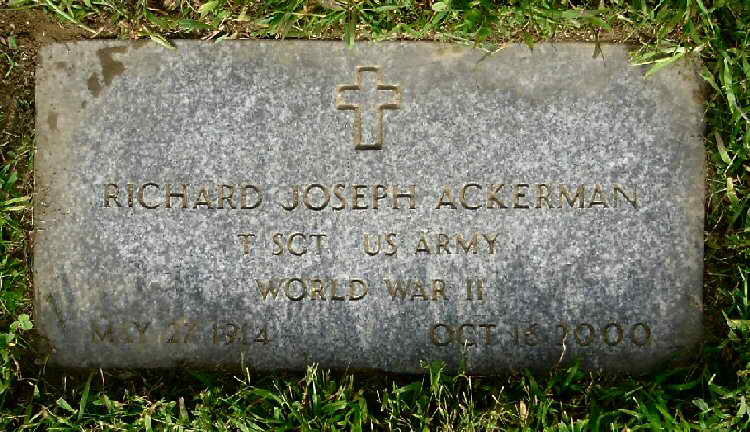 Grave marker for Richard J. Ackerman in Saint Michael's Cemetery, Springfield (Hampden County), Massachusetts.